I made it to San Onofre this morning. We got there just as the tide was going back out and the surf was getting slightly bigger. I had a lot of fun meeting a lot of the locals today. I had one lady walk up with her pre-teen son and ask “are you somebody famous?” I just smiled and said “soon.” There was a professional surfing photographer that stopped by for a while too. Bob Foster has a dad who was an animator with all of the studios in LA. I asked him if his dad was Walter, and he said that he was his GRAND-father. Pretty cool. Walter Foster helped me in my early days by supplying me with some great starter drawing books. In a big way, those Walter Foster books got me started. What a cool full circle meeting I had today with Bob. Each day I paint, I am learning more. 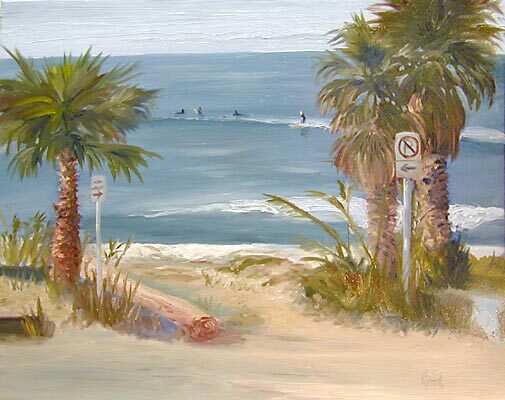 Today’s big revelation was painting the trunks of palm trees. I was reading about how Monet, Seuart, Van Gogh and the rest, were able to mix color not with the brush, but by putting a red spot next to a blue spot. The result is an “optical blend” of purple. I experimented with more of the brush-work that they used to create this effect. The colors I used however, were simply mixed on my palette. Back to San Onofre today. I saw a few of the same locals I met last week. This set of palm trees sit near the south end of the parking strip. They are this lone clump of palms that have always been watching the surf here. Their spent palm frawns have never been removed from the trunks, so they look like they have these long ZZ Top beards. This is my first beach scene with no beach in it. The ocean lies just to the left of the parked cars. I am really enjoying the simple palette that Ken Auster showed me. It contains Cad Yellow, Alizarin Crimson, Ultramarine Blue. Also Carbon Black and Titanium White. Most of my greens are made from black and yellow. Sometimes there is a touch of blue to cool down the shadows. I met John Eagle at Art Walk and he uses a very bright color palette. I want to do some workshops with him also to get a bit bolder with my colors and spread my wings a little.